The end of any great journey or vacation is always bittersweet. On one hand you have a wonderful collection of memories and experiences, but on the other hand you are left wanting more. 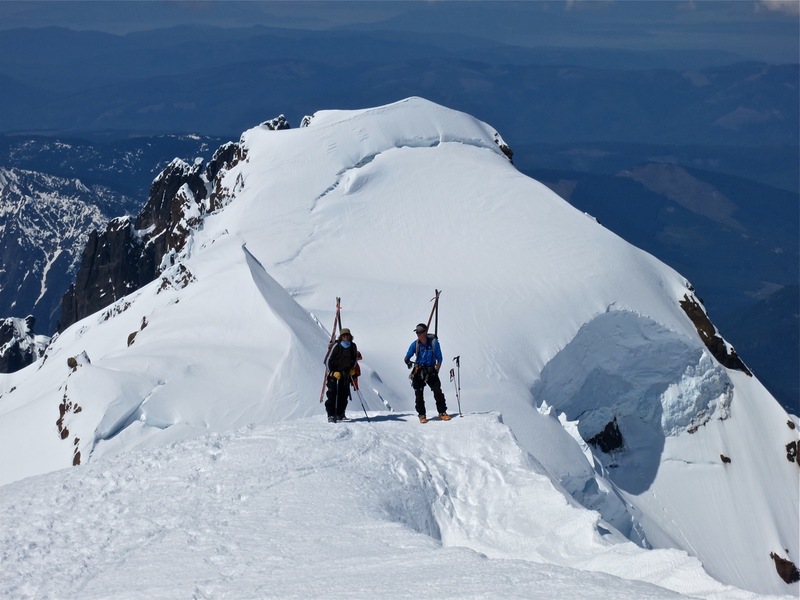 Now that we have wrapped up our Volcano Tour with yesterday’s ascent and ski of Mt. Baker, we all find ourselves fulfilled, but at the same time wondering what to do today? To me this is the true measure of the success of an adventure. We succeeded on many levels, yet are now as motivated as ever for more. Our final volcano mission on Mt. Baker was somewhat fortuitous. We drove many hours north after our long one-day ascent of Mt. Rainier on the 17th and arrived in the Mt. Baker ski area parking lot at midnight. Everyone was truly exhausted. Christy Mahon, who was driving a car with her husband Ted, even pulled over at Chair 1 at Mt. Baker, unable to drive any further. Ted took over and drove the final 100 yards to the parking lot! The next day we had grand plans of doing the long traverse from the ski area to Mt. Baker volcano, but Mother Nature and our own lack of energy stood in the way. We were unable to get out of the Land Yacht before 10 am, and after 4 hours of touring in the clouds on Ptarmigan Ridge with limited views of the volcano, we decided to call it an active rest day and head back to the parking lot to regroup. It’s nice when the weather makes decisions for you. (never mind that this route is super-long and would require a much earlier start). The group discussed out option and decided it would be best to attempt Baker the next morning from Glacier Creek, a road/ drainage on the north side of the mountain. We headed down that afternoon to scout the road and found a sweet, abandoned RV park right at the base of Glacier Creek road to park the RV. The proprietor was there and we paid him ten bucks and plugged into his power and water. This afternoon provided a wonderful opportunity for a BBQ so we grilled up some fresh fish tacos with slow marinated Tilapia we had picked up at Whole Foods Market in Portland. The mood was easy as the group (Ted, Christy, Ian, Grant, Jess and myself) along with friends Tim (from Snowtroopers.com) Andy (a Baker patroller) and Holly Walker and her friend from Whistler (who were finishing some training before heading to Denali) enjoyed some cold beers and great stories of recent adventures. Everyone needed to catch up on sleep so it was lights out at 9 and a 4:15 am wake up. The new dawn was clear and blue. Mother Nature was at it again, blessing me and my team with a perfect day. Up the road to the summer trailhead we climbed, feeling our engines warm up as the sun crested the ridges to the east. On the morning approach up the glacier to Mt. Baker. 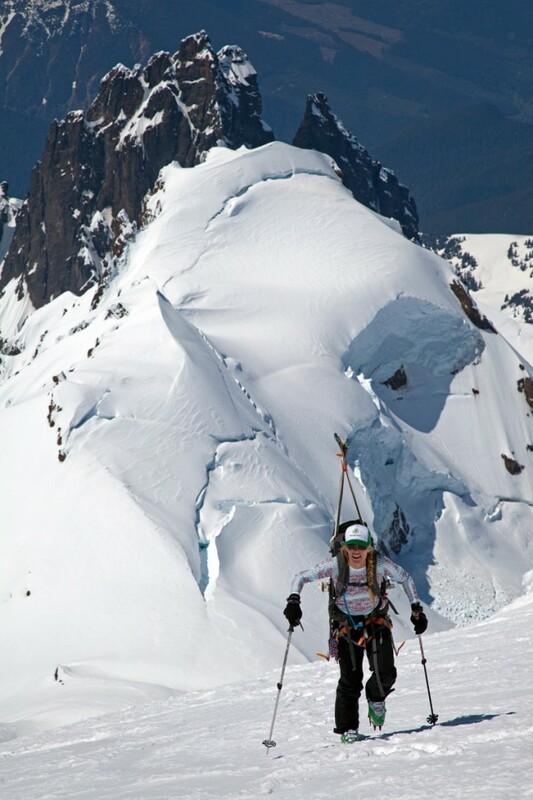 We would ski the glacier inside of the right skyline. 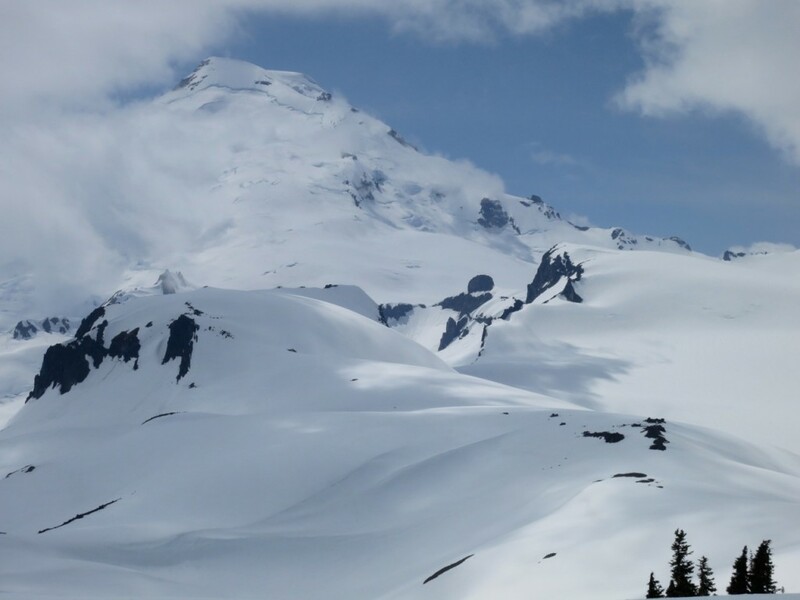 Mt Baker is big and beautiful. The vertical relief is large, nearing 8000’ from where we started, but after a string of huge days on our project we don’t bat an eye at that anymore. 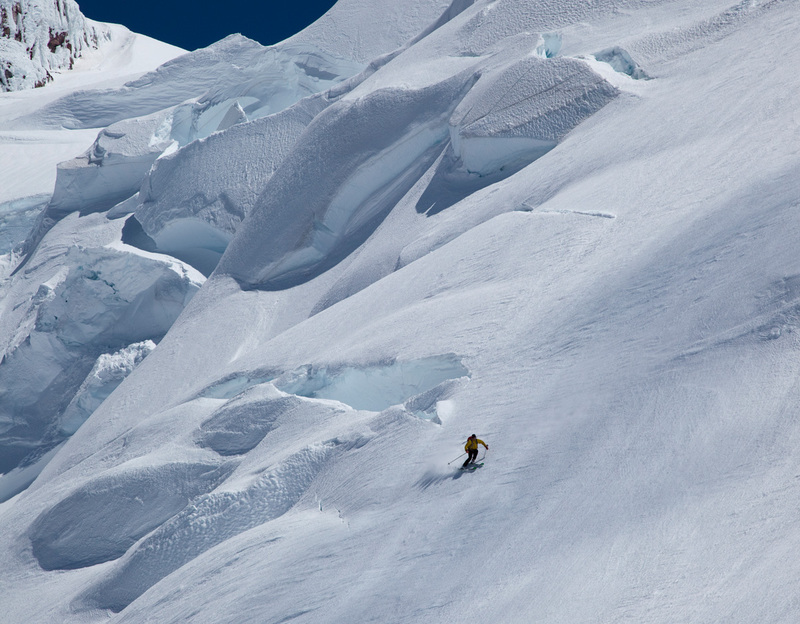 The group made fast progress up the Coleman-Denning route and climbed on firm, frozen corn snow onto the glacier. We ran into various friends along the way, skiers we had met over the years and in various parts of the world. 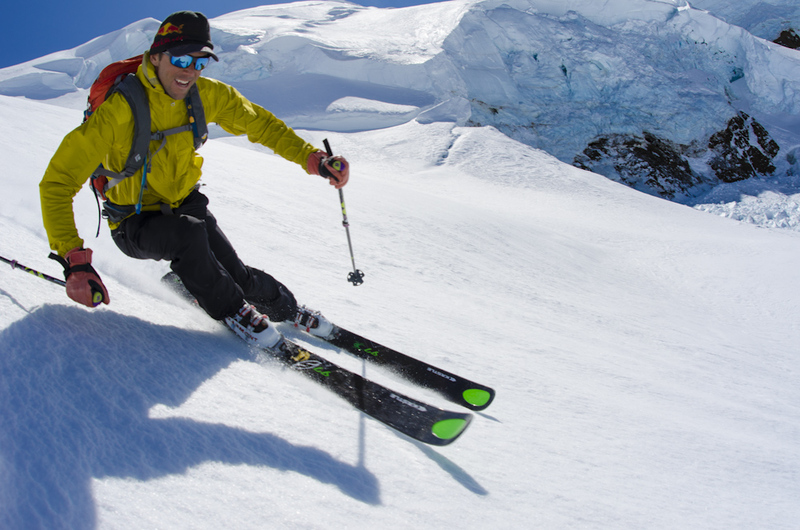 It’s always cool to be reminded how small our great ski community really is. We also ran into someone we had met on the summit of Mt. St. Helens, and I even ran into an old high-school classmate near the summit, Matt Schonwald, who runs BC Adventure Guides out of Seattle. 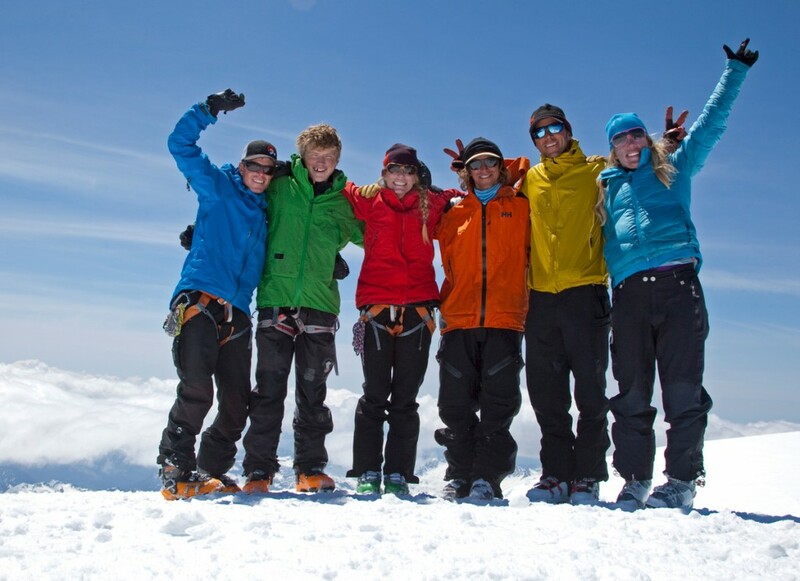 The crew on top with our young-gun friend Andrew in green. We swear there was no discussion of color-coordination. As is somewhat typical of these volcanoes the top is still frozen, the middle section absolutely perfect, and the lower slopes a little sticky. Baker was no different. 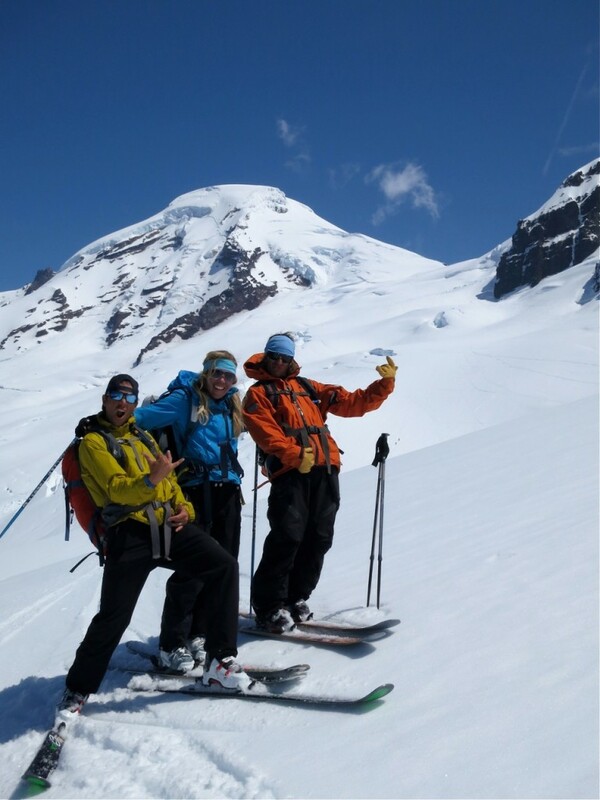 We slid down the loud, frozen snow off the summit cone and into a cool, steep serac-ridden face that made for a fun little side adventure from the main route. 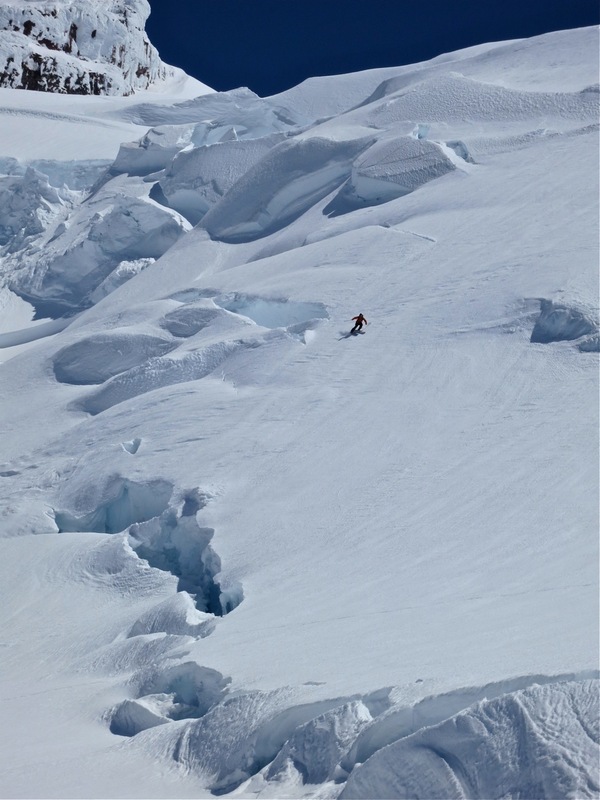 Although the skiing wasn’t anything special, it is always fun to safely negotiate interesting terrain high on a steep glacier. Ian, Jess, and I skied out right while Ted and Christy came around to the left to ski the smoother slopes of the main climbing line and shoot some pictures from below. Once we finally entered the perfect corn-snow zone it was game-on! High speed SG turns that went on and on and on. Tim from SnowTroopers.com was filming and we were all hooting and hollering, enjoying the incredible reward that we all get as ski-mountaineers- put in the hard work going up and then enjoy the spoils on the way down. Back at the cars it was finally time for some serious hugs of thanks all around. We had done it! 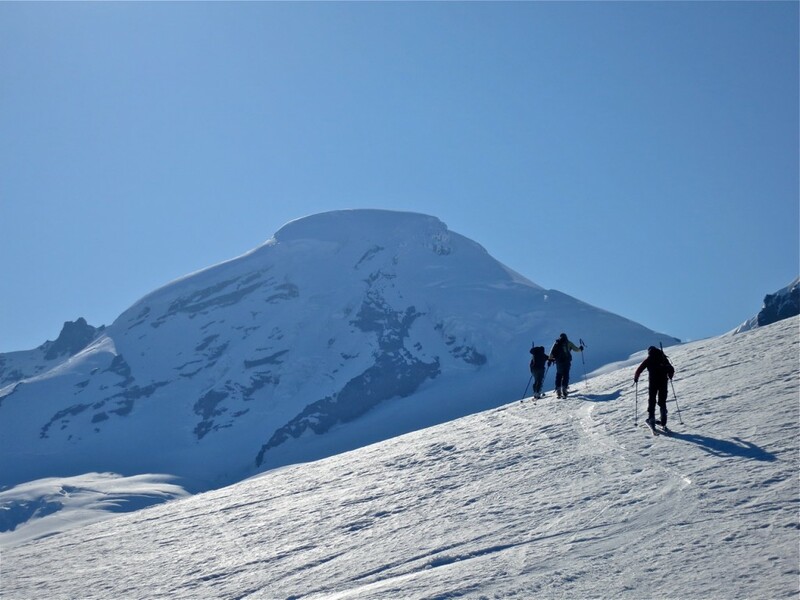 We achieved our goal of skiing as many volcanoes as we could during this great weather window, and having done it safely we could be proud of all the planning and hard work we put into it. Fifteen volcanoes in fourteen days with old friends and many new one as well. This trip has been one of the best road trips I’ve ever done in my life. All I can say is thanks to everyone involved. The crew admires another “X” on the back of the Land Yacht. 15 Volcanoes in 14 days. I will summarize the Volcano Tour along with details from each volcano and a plentitude of thanks to everyone involved in the next blog post. In the meantime we are hosting a photo contest on Instagram right now. 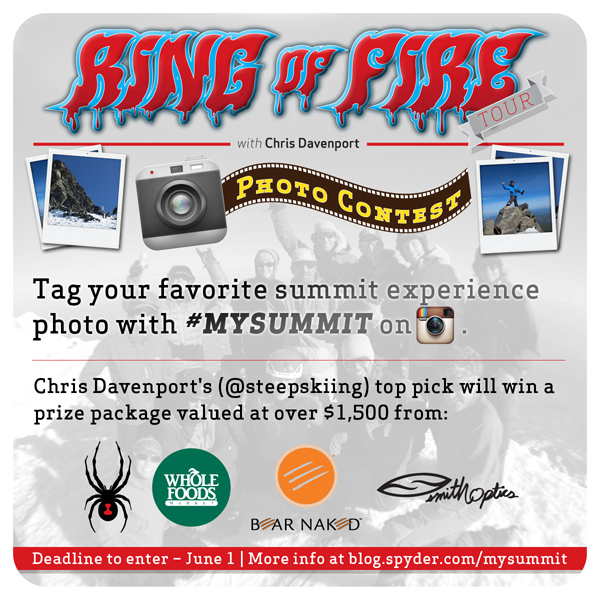 This will be really cool and we have some amazing prizes for the coolest summit photo. 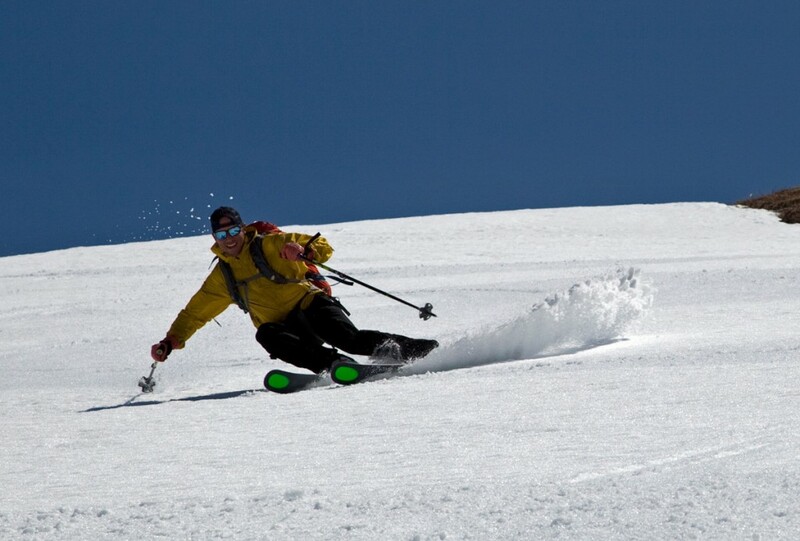 We are also hosting a party at Sturtevant’s Ski Shop in Bellevue, WA on Tuesday 3-6 pm and everyone is invited. I hope to see many of you there. Until then, thanks for reading and keep following along on Facebook or Twitter.